What is your favorite attraction EVER at WDW whether it is still there or not? DisneyDad: Thinking of my favorite attraction at Walt Disney World is difficult. There is so much I have enjoyed there over the years. The first thing that comes to mind that I still miss is the Mickey Mouse Revue. I enjoyed watching Mickey conducting that orchestra. Next is the Haunted Mansion. Riding through a haunted house with your “ghost host” has always been fun… and at the end you hear a request to “come back” and “be sure to bring your death certificate” so you can join the 999 happy haunts. One of my favorite “attractions” is still there, sort-of. I use to love to go to Cinderella’s Royal Table inside Cinderella Castle when it was King Stephan’s Banquet Hall. Of course the question was always “why would Sleeping Beauty’s father have a restaurant in Cinderella Castle?” I miss the pewter plates and water goblets they used back then. I love it because it was a restaurant of character, not a restaurant with characters. I loved the King’s Cut Prime Rib too. I believe it had already changed its name, but not its atmosphere, when my wife celebrated our 25th Anniversary there. Our daughter surprised my wife by coming to dinner with us to celebrate. After dinner the waitress brought out a gift I had purchased for my wife as well as presenting us with beautiful restaurant logo champagne glasses with lots of Pixie Dust (Mickey head confetti) on the table. My absolute favorite attraction is the feeling I get when I walk down Main Street, hand-in-hand with my wife and remember. I remember coming with my parents when the park first opened. I remember our first trip on our honeymoon. I remember sitting on the curb watching the 3 o’clock parade with my daughter in my lap. I remember the wonder on my son’s face the first time he saw Cinderella Castle. I remember bringing my in-laws and my mother-in-law fun at getting on the first bus that came by just to see where it takes you. I remember my daughter’s wedding at the Wedding Pavilion and a Glass Slipper. I remember fireworks as Amy told us she was expecting. I remember walking hand-in-hand with Tink as she took her first steps on Main Street. I remember dinner at Olivia’s. And soon I hope to take Tink’s little brother or sister on a walk down Main Street so one day they can remember. Ridge: Most of the attractions I started with are still intact but I would have to say I am a coaster fan. 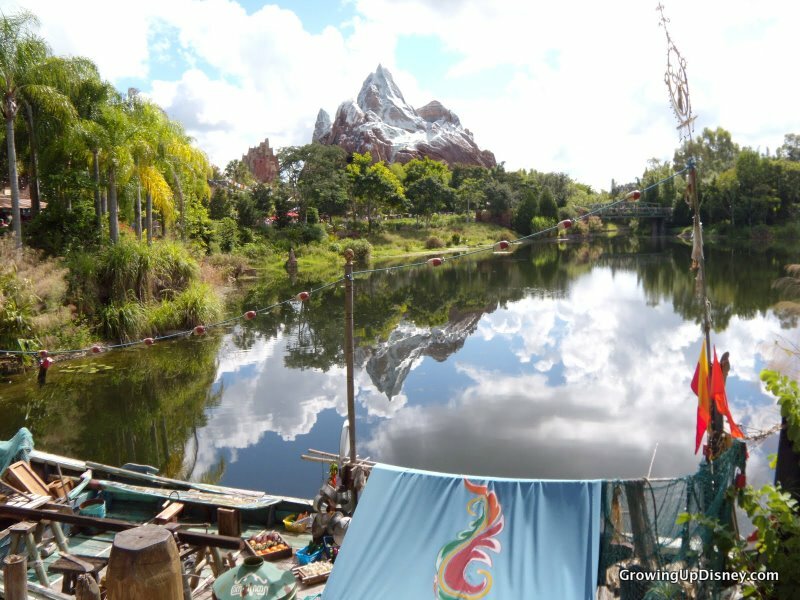 I love all the mountains: Space, Splash, Thunder, Everest, as well as Rockin' Roller Coaster and the awesome Tower of Terror. Amy: My favorite attraction ever is American Adventure. This show combines the ultimate in my history nerd-dom and my Disney geekery. Dad and I took a tour once about architheming (Disney loves to create their own words. Can you imagine the buzzwords that must be commonplace in their corporate meetings?) The building is an excellent example of forced perspective. To accommodate the show inside, it needed to be about five stories tall however that would be too large for the colonial architecture. Stop and take a look next time you are in World Showcase. They’ve done a really convincing job of making the building appear to be three stories on the exterior. Once inside, the rotunda is beautiful and the acoustics are wonderful for the groups that perform there. Voices of Liberty is the group you’ll see most often there and American Vybe used to appear semi-regularly. (Geek moment: I once was thrilled to see Jennifer from MMC in American Vybe.) About the show itself, I love watching this brief (and relatively cheerful) telling of the history of our country. The audio-animatronics are impressive. Chris and I have been known to sit on the front row to get a better view of the figures. I was so proud that Tink sat still and watched the whole show during this fall’s trip. The montage at the end always gets me. Other than American Adventure, I love the classics: Haunted Mansion and Small World and Disney’s newer attractions that have done a great job with theming: Kilamajaro Safaris and Expedition: Everest. I've enjoyed the attractions that are no longer with us, but Walt Disney World will always be a place that is always changing. And this is how Walt wanted it. While I may miss the old, it's fun to see what the Imagineers will create for us next. I'm with you disneydad. to me, disney will always be main street leading up to cinderella's castle. I know it has almost become cliche among disney fans, but I still hold horizons out as my favorite attraction. the last time road it, I was 14... but I still remember it so vividly. it was one of those rides we rode over and over and over. as far as contemporary rides, I guess I'll go with test track, american adventure or philharmagic. Two of my favorite Disney attractions are here. First, walking down Main Street and seeing the castle ahead always gets me a little teary-eyed, especially now with my two Princess loving daughters. Just something about the feeling I get when my girls show their excitement (big smiles, pointing, cheering) when they see the castle keeps that as a favorite. And, speaking of tears, The American Adventure is by far my favorite. I love the show, the drum and fife corps, and Voices of Liberty. I get choked up here too, but like Amy, I am a history buff, especially when it comes to the American Revolution. I'm glad to see all the love for the American Adventure! Everybody makes fun of me because of that one! :) I think that growing up my favorite attraction was The Great Movie Ride. I always looked forward to it as a kid. I know nowadays it's a little outdated, but when I was a kid it felt magical. Thanks for a great post.